Sesame seed - (Google Photo). Sesame seed from Nigeria has become an elixir of life for the Japanese. They just cannot seem to get enough of it. 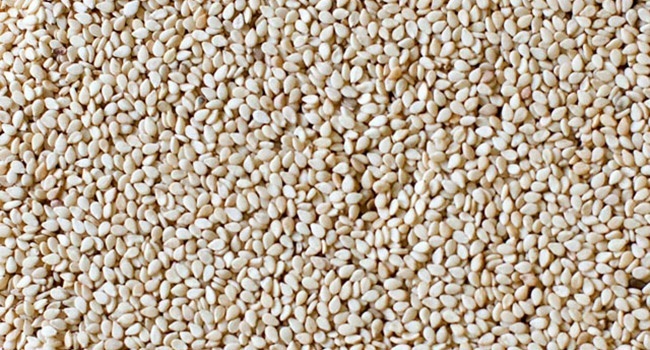 As a result, Nigeria has become the biggest supplier of Sesame Seed to the Asian country. The Deputy Trade Commissioner of Japan External Trade Organisation, Chiharu Yamamura, said this while making a presentation at a seminar. It is part of the selection process for participation of Nigerian food and beverage exporters in the 43rd edition of the International Food and Beverage Exhibition in Japan. “We eat sesame seeds and sesame oil in our daily life,” he stated. The JETRO deputy commissioner added that in 2016, Japan imported 54,276 metric tonnes of Sesame seed valued at ¥6.329 million (Japanese Yen), about 17.7 million naira from Nigeria. Recent report from the National Bureau of Statistics, which listed sesame seed among the largest agro exports from Nigeria in the first quarter of 2017, supports his claim. According to the report, Nigeria made 13.03 billion naira from the crop during the period in question. The current international price of sesame seed is put at $1,600 or $1,650 per metric tonne. At the end of the workshop, the Nigerian Export Promotion Council published a report showing that in collaboration with the Japan External Trade Organisation, it was spearheading the participation of Nigerian exporters to the 2018 Food and Beverage Exhibition billed to take place in March 2018.